Kanye West, Candace Owens, Ben Carson, Stacey Dash – black Republicans have found their kin in the alt-right. 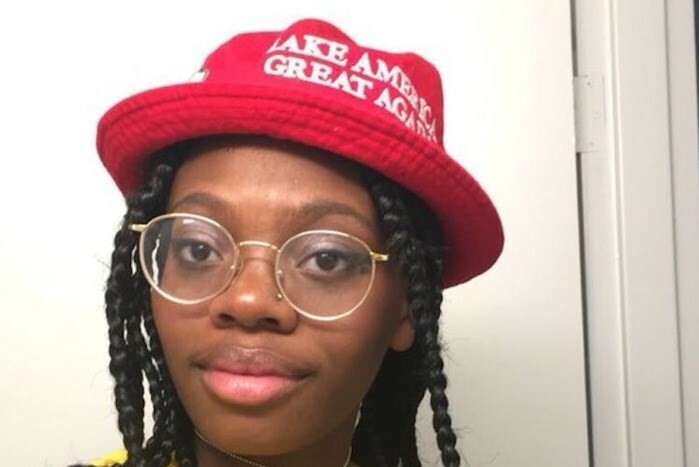 With right-wingers online advocating for Blexit and #WalkAway – a mass departure of African American voters from the Democratic party – one girl opted to take advantage of the MAGA brigade’s obsession with winning black people over. Taking to Twitter, a student named Quran tweeted: “I will not hide any longer, the left has made us feel as if us black Republicans should hide!! But not anymore!! #BlacksForTrump #WalkAway #maga (sic)”. The caption accompanied a photo of the girl wearing a red “Make America Great Again,” bucket hat. She then claimed that after the tweet went viral she was disowned by her parents and kicked out. “My mother literally woke me up out my sleep and screamed at me “how could you support this monster” she doesn’t even know him so how can he be a monster I just wish they understood (sic),” she wrote. Her tweets featured screenshots of alleged conversations between her and her mother. However, it was all actually a scam, and she bragged that she had done so to raise money for a new phone, rent, and tuition fees. She clarified that stealing from Republicans isn’t bad “because Republicans aren’t people”. Initial rumours of her earnings seem to have been largely inflated as the Intelligencer spoke to her over the phone, where she reportedly admitted she didn’t raise much money at all. She also told the site that she had refunded the money she had initially received. She says that her only regret is that she wishes a better photo of her had gone viral – consider us all finessed.